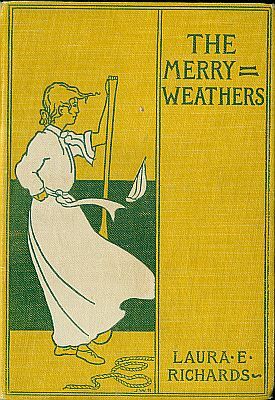 I finally got a chance last week to read The Merryweathers, the last book in the Three Margarets series (thanks to Elizabeth’s prompting — I’m not sure when I would’ve gotten around to looking for it again on my own). This one requires a bit of explanation. The Margaret series is sometimes considered to be the second half of the Hildegarde-Margaret series, because while the Hildegarde and Margaret series are each capable of standing on their own, they each feature the Merryweather family pretty prominently in their later books. In the Hildegarde books, the oldest Merryweather daughter, Bell, becomes Hilda’s best friend, and Hilda ends up marrying Mr. Merryweather’s younger half-brother Roger. Meanwhile, the rest of the family, especially the oldest boys, twins Gerald and Philip, inject some much-needed lightness into Hilda’s too-serious world-view. Margaret Montfort is even more serious-minded than Hilda, and therefore even more in need of Gerald Merryweather, so it’s fitting that he falls in love with her. Peggy, on the other hand, is thoughtless and scattered, so when she goes off to boarding school, sheet meets Gertrude Merryweather, AKA the Snowy Owl, whose ideals are higher than Peggy’s and whose personality is more down-to-earth. What I’m trying to say here is that the Merryweathers have been there primarily to counterbalance the main characters. So I was interested to see what a book centered around them would be like. And really, it’s exactly what I ought to have expected: there’s a lot of lighthearted fun involving word games and boating, and nothing really happens, unless you count Gerald pushing his cousin Claud Belleville into the lake. Also, Margaret and Gerald get engaged. So do Bell and Jack Ferrers, one of Hildegarde’s other neighbors, which was a much more exciting occurrence, as I’ve literally been waiting for it for years. And Peggy and Phil seem to be headed in a similar direction, which makes a certain amount of sense, since Laura E. Richards is clearly one of those authors who like to pair off all the available characters. Really, The Merryweathers reads like what it is: the last chapter of a much longer story. Everyone gets paired off, there’s no discernible plot, and every chapter recalls bits of the previous books, which definitely added to my enjoyment. I found The Merryweathers to be kind of ridiculously fun, but I don’t think it would do much for readers to weren’t already familiar with Hildegarde and the three Margarets. Oh, absolutely! I think you can only read The Merryweathers if you’re already a Hildegarde-Margaret fan, otherwise it makes little sense. Still, I was so happy for Margaret and Gerald to finally get engaged. Margaret is so dang demure and modest I was beginning to wonder if she’d ever figure out that Gerald was crazy for her. I sometimes wonder if Gerald isn’t a bit too good for Margaret. I mean, she’s awfully nice, but Gerald is one of my favorite Richards characters, and while I can see why he’d fall in love with her, maybe he’d be happier in the long run with someone a little more…lively? Margaret’s no Hildegarde. But maybe I’m thinking too hard about this.